The talus is the second largest tarsal bone and is also the second most common tarsal bone to fracture. They typically occur following high-energy trauma, such as a fall from height or road traffic accident, during which the ankle is forced in to dorsiflexion; this causes the talus to abut the tibial plafond, resulting in a fracture. Most talar fractures occur through the talar neck (~50%) and, less commonly, through the body, lateral process or posterior process. The talus is reliant predominantly on extraosseous arterial supply, which is highly susceptible to interruption in the context of fractures; consequently, the talus is at high risk of avascular necrosis after fracture. Patients will present with a history of high-impact trauma, with immediate pain and swelling around the ankle. If the talus is dislocated, there will be a clear deformity. On examination, patients will be unable to dorsiflex or plantarflex their ankle. It is important to check if this injury is open or closed. Moreover, in the context of talar dislocation, the overlying skin may be ‘threatened’ (i.e. white, non-blanching, and tethered), heralding an impending conversion to an open injury. Assessing distal neurovascular status is also vital. The main differential diagnoses to consider in cases are ankle fractures and Pilon fractures. Initial assessment of all suspected talar fractures requires plain film radiographs, both antero-posterior and lateral. Lateral films should ideally be taken in dorsiflexion and plantarflexion, in attempt to differentiate between type I and II injuries (see below), as plantar flexion will reduce any subluxation present. For complex injuries, CT imaging may be required for further detailed assessment and aid in management planning. Talar neck fractures can be classified by the Hawkins Classification. This aids in both management planning and can determine the risk of avascular necrosis (AVN). Management of talar neck fractures is dependent on their Hawkins classification. Broadly, all undisplaced may be managed conservatively in a non-weight bearing orthosis, whereas all displaced fractures require immediate reduction (in the emergency department) and then subsequent surgical repair. Type I fractures can be treated conservatively in a plaster with non-weight bearing crutches for approximately 3 months. Following this, the region should be assessed for evidence of union and avascular necrosis in fracture clinic. Type II – IV fractures should initially be managed with attempted closed reduction in the emergency department. Once reduced, a cast should be placed and repeat radiographs obtained to ensure it remains in position. If reduction is not possible, open reduction out-of-hours is needed. Definitive surgical fixation is required on the next available list with the correct expertise, with referral onward to a tertiary centre if needed. Post-operatively, patients will require an extended period of non-weight bearing. 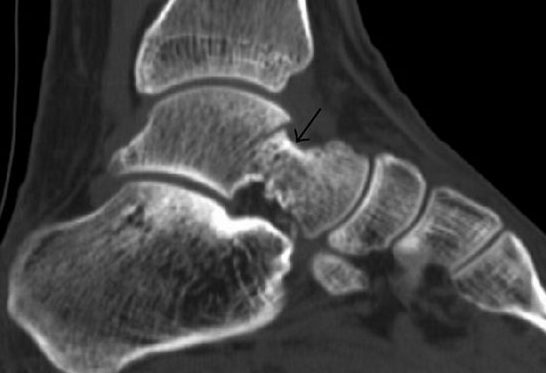 The main complication of talar fractures is avascular necrosis, occurring in 17% of cases following talar fractures*. It occurs most commonly after Hawkins type II-IV fractures (often this is not influenced by the anatomical reduction performed). Osteoarthritis may occur secondary to avascular necrosis or malunion involving any the talar joints. If this is severe, arthrodesis may have to be considered. *Hawkins sign is subchondral lucency of the talar dome that is visible 6-8 weeks following injury; this is indicative of sufficient vascularity of the talus and therefore suggests low risk of avascular necrosis.